Senate Finance Chair Jane Nelson of Flower Mound and Lt. Governor Dan Patrick laid out the proposed state budget for 2016-2017 at a Tuesday press conference. 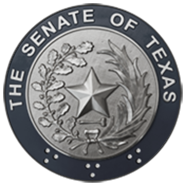 (AUSTIN) — The Chair of the Senate Finance Committee laid out the Senate version of the initial state budget Tuesday, showcasing a plan to reduce property taxes while increasing funding to education and border security. 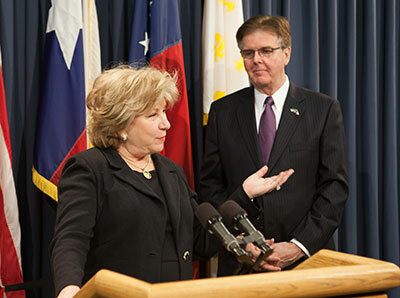 Senator Jane Nelson of Flower Mound said that this budget follows the same principles that allowed Texas to weather the national economic downturn. "This budget is responsible. It's compassionate. It meets our growing needs and remains true to the policies of fiscal discipline that has led to the Texas miracle," she said. "It keeps the economy growing. It provides jobs and opportunities for our citizens." At $205.1 billion in both state and federal funds, the proposed budget for the 2016-2017 biennium represents a modest 1.5 percent growth over the last biennial budget. It prioritizes $4 billion in tax cuts, a change that Nelson says will be meaningful. "That's relief that taxpayers will actually see and feel," she said. It would reduce property taxes by $3 billion and includes a further $1 billion to reduce franchise taxes. The actual mechanism through which this relief will be accomplished, said Nelson, will be proposed in other legislation. The proposed budget also includes more than $800 million for border security, twice as much as last session. Nelson told reporters that the state must step in to fill the gap where Washington has not. "We cannot stand by while the federal government ignores this problem because Texas bears the cost of their inaction," she said. "We are going to provide for a strong, sustainable, well-trained force on the border with the best possible technology." Lt. Governor Dan Patrick, who joined Nelson at Tuesday's press conference, has emphasized the need for border security both in his campaign and following his election. Other provisions in the budget include more money to fund enrollment growth at public schools for a projected 168,000 new students over the next two years, as well as money that doubles education funding for students with autism. Nelson's proposal budgets more money for mental health services, including $18 million for crisis health services and $20 million for community mental health services for veterans. On the transportation front, the proposed budget would end diversions from the state's transportation fund, and would increase funding through a one-time use of $1.5 billion from motor vehicle sales tax collections. The budget bill filed Tuesday represents only a starting point for the Senate's plan for state appropriations over the next two years, and the Senate Finance Committee will begin hearings this week in order to hear from state agencies and the public about where spending priorities should lie. Nelson believes that she and her fellow committee members will write a budget that meets the needs of Texas while maintaining fiscal responsibility. "Together we will pass a budget worthy of our state and create a Texas miracle tomorrow that surpasses the Texas miracle of today," she said. The Senate will reconvene Wednesday, January 28 at 11 a.m.